In our Friday’s note, we had mentioned about possible attempts by NIFTY to gain some stability after few series of decline. The Friday’s session saw a sharp uptick in the Index and the benchmark NIFTY50 ended the day with a decent gain of 125.20 points or 1.18%. It needs to be noted that the upsurge that was witnessed in the previous session has been mainly on back of short covering. As we approach Monday’s trade, we still need to be cautious as we approach the Markets. NIFTY is still not out of the woods. 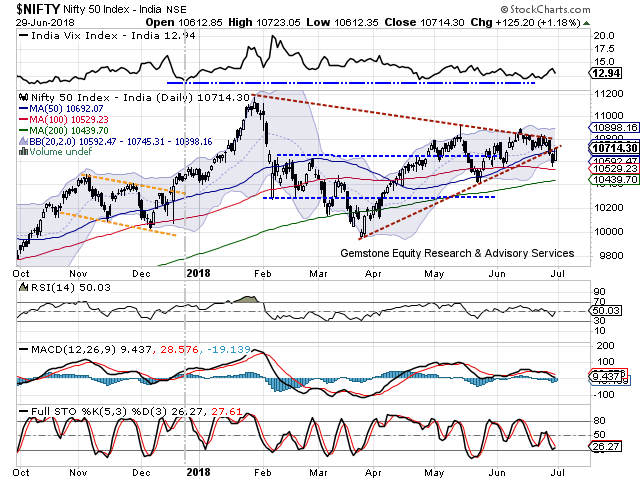 With the sharp technical pullback that was witnessed in the previous session, it remains unclear that whether the downward breakout in the NIFTY has failed and the Markets may continue with its pullback; of the present pullback just remains a dead cat bounce. Monday will continue to see the levels of 10765 and 10800 posing resistance to the Markets. Supports come in at 10690 and 10610 zones. 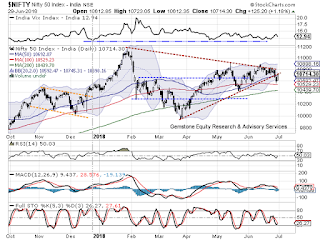 The Relative Strength Index – RSI on the Daily Chart is 50.0297 and it remains neutral without showing any kind of divergence against the price. The Daily MACD is still bearish while trading below its signal line. No significant formations were observed on Candles. If we look at the pattern analysis, the NIFTY has pulled back sharply after slipping below its 50-DMA. Presently, it has inched higher than the 50-DMA and has held this as support at Close. On the other hand, the downward breakout from the large symmetrical triangle still continues to persist. Overall, we recommend continuing to approach the Markets with caution. We might see a flat to mildly positive start to the trade on Monday, but it would be critical for the NIFTY to now move past 10800-mark for a sustained pullback. It is not yet confirmed that whether the downward breakout of the NIFTY has failed or the present up move just remains a dead cat bounce. We also recommend to remain largely exposed to the large caps as the broader Markets may still continue to see some prolonged pressure. Relatively resilient technical set up is observed in stocks like IDBI BANK, ADANI POWER, JAIN IRRIGATION, ASHOK LEYLAND, TATA MOTORS, IDEA, ITC, TATA STEEL and JET AIRWAYS.